My name is Karin Loewen and I teach Suzuki cello, viola, and violin lessons and run the Cape Cod Summer String Tune-Up, a week-long summer strings camp. I learned to play violin and cello using the Suzuki Method while attending Whitinsville Christian School in central Massachusetts. WCS is a K-12 school which has an extensive Suzuki program and I am thankful for the opportunities I had there. I actually started on violin when I was five years old, but around age seven I decided I'd prefer an instrument that would allow me to sit down so I switched to cello! Music was a constant part of my life growing up. Our school orchestra toured annually to locations in the US, Canada, and Mexico. I was in third grade the first time I went on tour with the orchestra and continued to do so through high school. In high school I also participated in MA Central District and All-State orchestras and also played in a youth orchestra at New England Conservatory. I attended Csehy Summer School of Music every summer in junior high and high school. I eventually went on to get a Bachelor of Music degree in Cello Performance from Wheaton College Conservatory of Music just outside Chicago, IL. Wheaton has a very large Suzuki pre-college program and it was through that that I was trained to be a Suzuki teacher. My pedagogy teacher was Rebecca Sandrok, who grew up in Japan and was taught by Shinichi Suzuki himself. During one summer in college I was able to visit the Talent Education Institute in Matsumoto, Japan and see where Suzuki taught. Another summer in college I studied at the Aspen Summer Music Festival in Colorado. After graduating from Wheaton, I set up my first cello studio of twenty students near Chicago, played in the Oak Park/River Forest Symphony Orchestra, and taught a String Techniques class to music majors at Concordia University in River Forest, IL. In the summer of 2001, I moved to New York and completed my training for Musikgarten and continued to teach Suzuki cello. In 2007 I moved to Cape Cod. 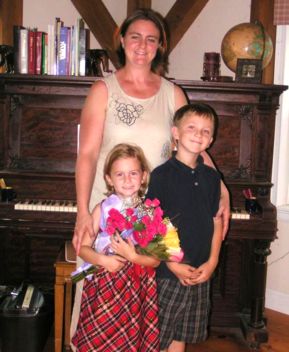 I taught preschool music classes for two years at Cape Cod Conservatory and opened my studio at home. I also teach private lessons on violin, viola, and cello at St. Francis Xavier Preparatory School in Hyannis and offer an after-school string ensemble there. As Christians, worship is something we do daily. It is seen in the ways we interact with people with Christ-like character. It is seen in the way we look around at the beautiful creation and thank the Creator for it. When we work, whether we are changing diapers, cooking dinner, folding laundry, flipping burgers, performing surgery, whatever it is, we do it “as unto the Lord” and in so doing we are worshiping him. A musician has this same responsibility in their weekday work, to practice hard and to strive for excellence to the glory of God, just like any other profession. As music teachers we recognize the responsibility of teaching well. We are told that pastors and teachers in the church are held accountable for what they teach on a spiritual level, but I think a similar accountability applies to school teachers and music teachers. We are responsible for what our students learn and we strive to do it excellently and with integrity. The church musician has a unique role. Beyond the personal excellence required of any work or profession, music has been offered as a part of corporate worship at least since the time of the tabernacle. (There is mention of musicians as early as Genesis 4:21 where we read about Jubal who was the father of all who played the harp and flute and various other instruments, depending on which translation you read.) In contrast, a doctor who may be God-honoring in his weekday work, does not go to church on Sunday and offer up surgeries to the Lord. A church musician uses the same skills during the week that are offered up to the Lord in a special way on Sunday. We have to look at the vocational and corporate worship roles of the Christian musician separately. As with any vocation we expect excellence from the Christian musician during the week, but what does it mean on Sunday? Church musicians are not called to perform for the congregation, but to bring an excellent musical offering to God, and it is their responsibility to lead the congregation into corporate worship with them. This requires skill, the level and style of which will vary depending on each unique situation. If the church is full of professional classically trained musicians, then maybe Bach cantatas are God-honoring. If the church has many guitar players, drummers, and singers of varying degrees of musical training, then a strong band-leader may be in order. It’s not about style, it’s about musical excellence to the glory of God. And just because a person has a heart for worship and is excellent at leading a band does not necessarily mean that they should try to get the group to do cantatas. All that would mean for the leader and the group is a promotion to mediocrity. We have to know our gifts and talents and excel at them. Let the singers sing, let the instrumentalists play, let the composers compose and in the end each skill complements the others and we have an excellent musical offering to our God. So, if corporate musical worship is an offering to God, where does the role of evangelism come in? Many churches use Christian contemporary music as a way to make the gospel accessible to non-believers or young people who may be able to relate to the musical style better than, say, hymns. That is fine, but still the point of music in church is not primarily to evangelize. When music in church witnesses to the glory of God it is because it can be so easily seen that the musicians and church as a whole find it important to offer their best to God. It is in the excellence of the offering that an outsider can see that we are thoroughly committed to the one to whom we are offering. In contrast, if the offering is mediocre, is it evident that we are committed to the one to whom we are offering? Or, to ask the question more strongly, if the offering is mediocre on a regular basis, ARE we committed to the one to whom we are offering? So, on a practical level, what is excellence in church music? We know that as humans we can never play or sing perfectly. Even if we hit every note and every rhythm, is there perfect dynamic or nuance? Dr. Best describes excellence as “being better today than I was yesterday”. When we bring our offering of musical worship to God we are responsible to continue to strive for excellence. When I was at Wheaton he would insist that no one use the phrase “practice makes perfect” and that instead we say “practice makes excellent”. On a personal note, if I am choosing what to play for communion and on Saturday evening I can’t get the notes or double stops in tune, I should choose something else to play, or play it in a way that is easier for me so that it is an excellent and pleasing offering to my Lord. I shouldn’t try to go up an octave on that last verse if the result is mediocrity. What is happening to church music in our culture? Well, the same thing that is happening to any music in our culture. Music is no longer emphasized in school, if it is taught at all. Many children now, Christian and non-Christian alike, grow up with little or no musical training. Culturally, it’s a shame. Biblically, it’s unacceptable. If we are to continue the God-ordained practice of corporate musical worship that has been in practice at least since the time of the tabernacle, we must train up our children to be excellent musicians so they can offer excellent music to their King. In generations past, this was less of an issue. Children learned music in school and Christian children could then incorporate it into their worship. If the schools are dropping the ball on music education, the church has to pick it up and run with it. Not only is it essential to God-glorifying corporate worship, but through the excellence of Christian musical offering we bear witness to our culture that God matters and is worthy of this most excellent offering. We must not let mediocrity seep into our corporate worship. We must continue to strive for excellence in our weekly musical offering to the glory of God. In summary, the essential roles of the church musician are to offer an excellent and pleasing musical offering to God, witness to his greatness through the excellence in the offering, and train up the children of the church to continue to do the same. My favorite part about teaching is getting to know each individual child. I love the challenge of figuring out how each specific mind works so I can cater to every child's style of learning. It's so exciting to see the joy on their faces when they learn something new and I'm happy to be a part of each child's development as a person as they learn not only to enjoy music, but get to experience the satisfaction of putting time and energy into a skill and being able to do it well. Music is enriching and I teach as Suzuki did, using music education as a way to help children become all-around beautiful people. from my recital with Rhonda Edgington. Cape Cod Cellos Youtube channel.